This is the first of three linked posts on the ‘deservingness of benefit claimants’. In this post, I explain the title, speak about the BBC programme that prompted the posts, and suggest why the British public massively overestimate the levels of benefit fraud. A few weeks ago, the BBC broadcast a documentary about the British benefits system called The Future State of Welfare (first 15mins available on YouTube). 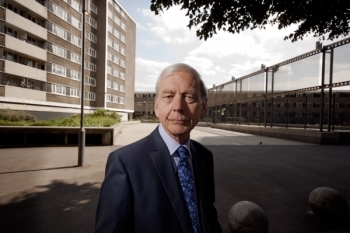 It was fronted by John Humphrys – mainly known for a macho, cynical and very effective approach to questioning evasive politicians – and argued that the original aims of the welfare state had been lost. Far from combating the evil of Idleness, the welfare state was adding to it by allowing the idleness of the lazy people who have no intention of getting a job. In other words, the problem is the ‘undeserving poor’. That the numbers of people who are outright fraudulent is small, despite all the press and public attention to it – and that this gap between perceptions and reality partly arises due to the few external signs of deservingness. (My topic this week). That there are greater numbers of people who are in some way genuine, BUT who refuse to take the worst jobs around. (One of the other arguments that Humphrys makes). That we have to think carefully about conditionality, and more generally, face the issue of deservingness head-on rather than refusing on principle to speak this language. I know that the term ‘deservingness’ will antagonise some people – but I’ll discuss this at greater length in the final post. First, though, the role of fraud. This is a staple of the tabloid press and reflects the taken-for-granted common sense of 21st century Britain, even among those on the left (of which Labour leader Ed Miliband is just one example). There are two possible explanations for this. Either benefits fraud is spectacularly high, and left-wingers with no real-life experience are deluding themselves (always a possibility…). Or people’s perceptions are mistaken, which begs the question: why? Now obviously it’s not simple to get good figures on fraud – we’re trying to find out about something that the people involved are trying to conceal. But the Department of Work and Pensions (DWP) are actually pretty good at looking at this. They don’t just use the recorded fraud figures, which would be an underestimate. Instead, they get a sample of benefit claimants, check all the administrative data on them that they can, and then speak to them for 30mins. Cases classed as ‘fraud’ are where they have a strong suspicion of fraud (not where they actually successfully prosecute them in the courts), according to Neil Bateman in this article – which mistakenly classes some people as fraudulent, and misses some of the most sophisticated organised fraud. So on these DWP figures, the level of fraud is low (0.8% of the £150bn benefits bill, + another 0.8% due to customer error in e.g. reporting changes in circumstances). Bear in mind, though, that there are 2.5m people claiming incapacity benefits alone. If 0.8% of these people are fraudulent, that’s 20,000 people. Which is more than enough to keep the pages of the Sun and the Mail topped up with the shocking cases that they so love to expose. Do we all know fraudulent claimants? Is this really the true scale of benefits fraud though? Amelia Gentleman’s account of benefits frauds investigators is mesmerising, and shows both the difficulties and the lengths that we go to to uncover fraud. But it’s still not clear to me if the DWP fraud figures involve this kind of sleuthing for a random sample, or if they primarily rely on a 30-minute interview. Eventually I’ll chase this up in the DWP, and report back what I find. Another recent source of evidence is some DWP ‘customer insights’ research, which puts 11% of out-of-work benefits claimants in the ‘Benefits is Better’ group on the basis of their attitudes to work. This sounds a bit like fraud, until you see that (i) 50% of this group are lone parents, 20% are not working due to mental health reasons, and 98% of these people say they have no chance of getting a job; and (ii) this is not an academic report, but a report to help the DWP to justify their policies. Or in the words of the study authors, the segmentation was decided upon by the researchers, the DWP and an advertising team who reached “a consensus based on which solution was most workable from a communications point of view and bearing in mind how DWP operates as a business.” Hmmm. In the meantime, we can look at some qualitative research for clues about benefit fraud. In Hartley Dean’s classic 1990s study of benefit fraud, only 1 of 35 people had been found out. Hartley Dean’s earlier book with Peter Taylor-Gooby, Dependency Culture: The Explosion of a Myth, found only a small number (about 1 in 16) were doing undeclared part-time work, but around 1 in 6 of this small, unrepresentative sample admitted they had ‘fiddled’ the system at some point. (For more in-depth treatments of people who have committed fraud, see Dean & Melrose 1996, 1997 and my colleague Lavinia Mitton’s 2009 report for the DWP). But this isn’t the prototype of ‘fraud’ that we have in mind – poor people who often can’t find full-time work, who do cash-in-hand work to try and get a little more money. (Jobseeker’s Allowance is £67.50/wk excluding housing costs, which doesn’t exactly fund a lavish lifestyle). Of all the qualitative research reports I’ve read, where are the people who simply don’t want to work under any circumstances, and are committed to defrauding the state? They do exist, but there are vanishingly rare. Perhaps the closest are the ‘alternatives’ in Andrew Dunn’s 2010 paper, who say things like “If the community itself is running on immoral principle and it says to you that you should join their morality, to assist them in an immoral act, then no it doesn’t work.” As should be clear, the kind of alternative values in this group aren’t commonplace. I think there are two main reasons why perceptions of undeservingness are so high. The first is that many claimants are in some sense deserving (they are genuinely sick/disabled, they genuinely can’t find continued work in the jobs they know how to do), but are also choosy in the jobs they would be willing to take – perhaps doing undeclared cash-in-hand work in the meantime. I’ll come back to this next week. The other reason is rarely commented upon, but critical: we often have no idea of the deservingness of other people. This is particularly true in the case of health problems and disability, where (i) much modern disability is unpredictable and fluctuating rather than consistently debilitating, which makes people very hard to employ but still able to do odd jobs around the house on their good days; and (ii) the disability is not visible externally. R: Well, if I had someone who could care for me and do all my washing, cooking, cleaning, and shopping, I would have enough energy, say, to do, maybe, a good two hours a day, a two-hour stint. But that would require someone… If I had a butler, I could do that (laughs). So, if you know any butlers going? From the outside, in those two hours, Rachel would seem ‘undeserving’ – she wasn’t working, yet she was bright, articulate, funny, and capable of doing a variety tasks around the house. It’s only when you spoke to her more closely that you realised that it was impossible for her to work in any realistic scenario. So: this week I’ve argued that outright fraud is low, but that perceptions of fraud are much higher, partly because of the hidden nature of some deservingness criteria (I’m sure part of the reason is the media as well, but I’m not willing to blame the media as much as some of my colleagues). Next week I’ll focus on the choosiness of benefit claimants – is there crap work available for them if they want it? And the following week I’ll conclude by asking: should we be forcing people to take crap jobs? This entry was posted in Articles and tagged fairness, political attitudes, public opinion, welfare payments. Bookmark the permalink. I found it relevant for my own work. Hopefully, you might too. A really interesting paper, thanks for sharing it! Thank you for this Ben, I look forward to the following posts. What is concerning me now that the Humphreys/Mail et al undeserving poor stance is being engineered as a distraction from a more sinister and destructive intent namely to abolish the concept of welfare entirely.